Amanda Palmer performing at the Middle East Wednesday night. 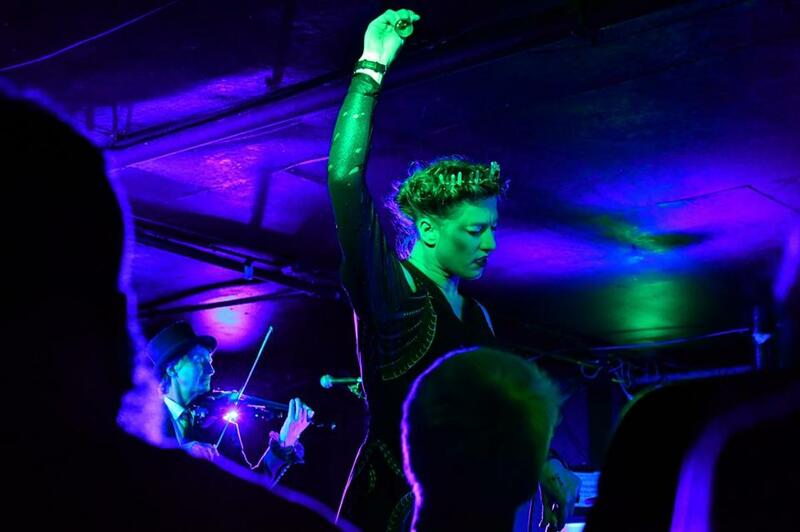 CAMBRIDGE — Any time Amanda Palmer gets onstage in front of her devotees, it probably feels a bit like a homecoming. That’s what happens when you successfully build a cottage industry out of a knack for telling your story through engagement with fans. Yet in the context of the Lexington native’s personal mythology, it’s a notable occasion to play the Middle East with Edward Ka-Spel, the prolific weird-pop priest best known for his group the Legendary Pink Dots. As a precocious teenager and Pink Dots fan, Palmer staged a theatrical adaptation of one of the group’s albums there. “As with all good Hollywood stories, I came back and I brought my friends with me,” she recounted onstage Wednesday night. Whether she specifically meant all the back-in-the-day pals she called out periodically or the entire audience, the message was more or less the same. The show was the first of a five-date US tour before a similarly brief visit to Europe. Joined by violinist Patrick Q. Wright, she and Ka-Spel played a large chunk of their poignantly desolate new album, “I Can Spin a Rainbow.” The obsessively insular material isn’t the most obvious fit for a rock club, but this performance was gripping. Wearing a tiara (or was it a crown?) of what looked to be crystals and minerals, Palmer held ground at the stage lip for several numbers. She drew all eyes toward her, demonstrating the intensity a gifted theatrical performer can summon through economy of gesture — a piercing glare, some slow movements of one hand that felt like a private murmur of intimate sign language. Like the show’s aesthetic overall, her presentation was spare yet mesmerizing. The lyrics of new tune “The Shock of Kontakt” seemed as if newly conjured, each phrase a fresh admission cued by a state of intense reflection. Her vocal performance of “Pulp Fiction” felt almost too intense for strangers to be watching. I felt like I should look away, but couldn’t.